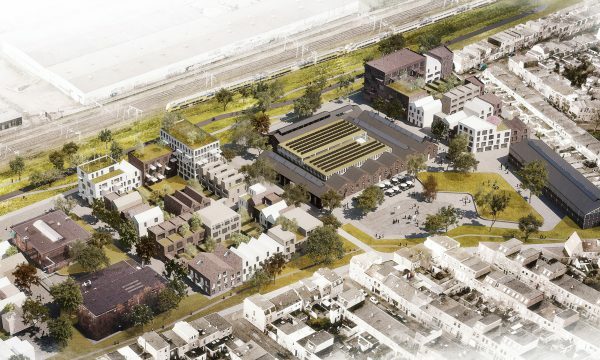 Pompenburg has the potential to become a new, connecting link in Rotterdam. 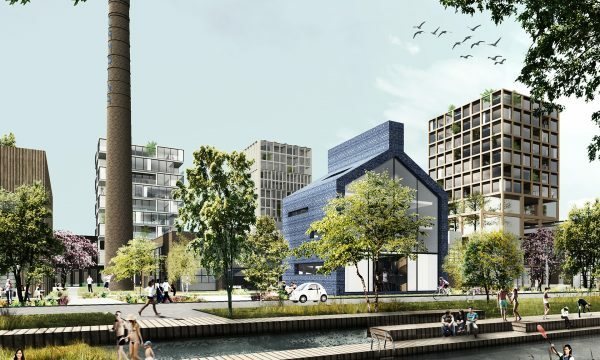 For this rather disjointed area between Pompenburg, Schiekade, Heer Bokelweg and Stroveer, we envision a connecting function in the future at multiple levels. 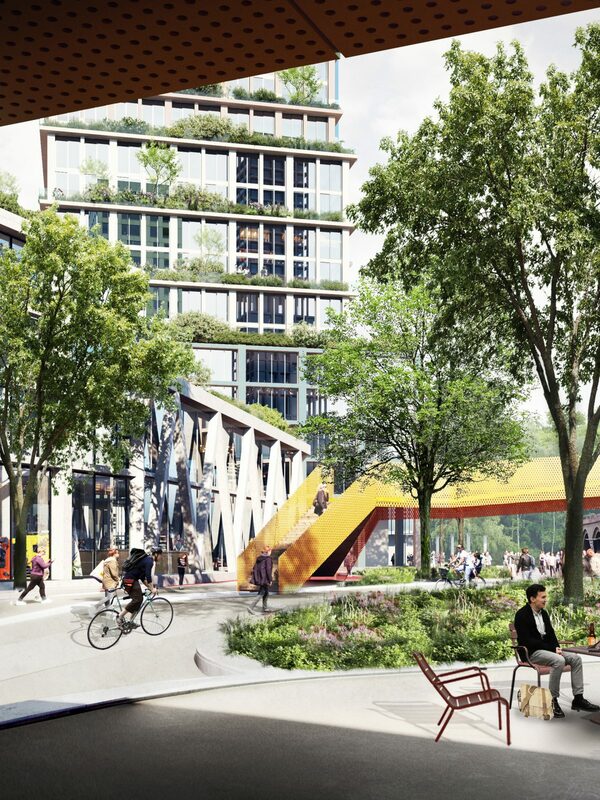 Firstly the redevelopment is designed to link spatially with the surrounding neighbourhoods of Agniesebuurt, Oude Noorden/ZOHO and the city centre. Removing the barrier formed by the rail tracks is essential to achieve this. 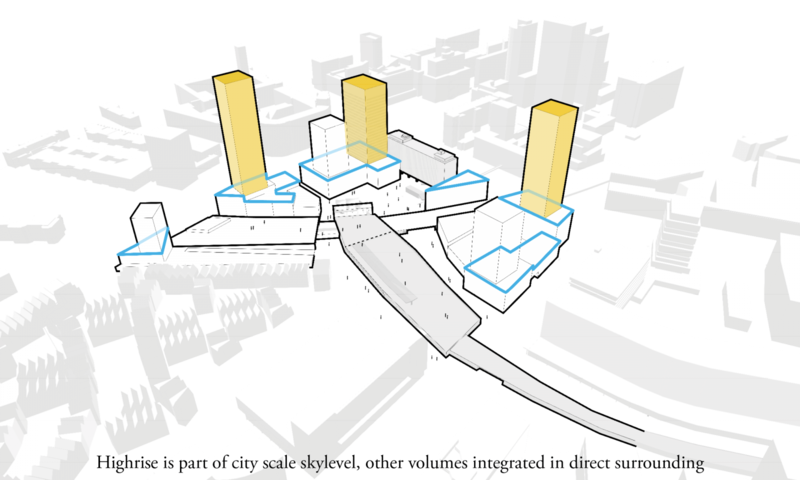 The plan also involves redeveloping the public space, on ground level and above on the station roof and the Luchtsingel. New buildings will connect to existing volumes in the area. 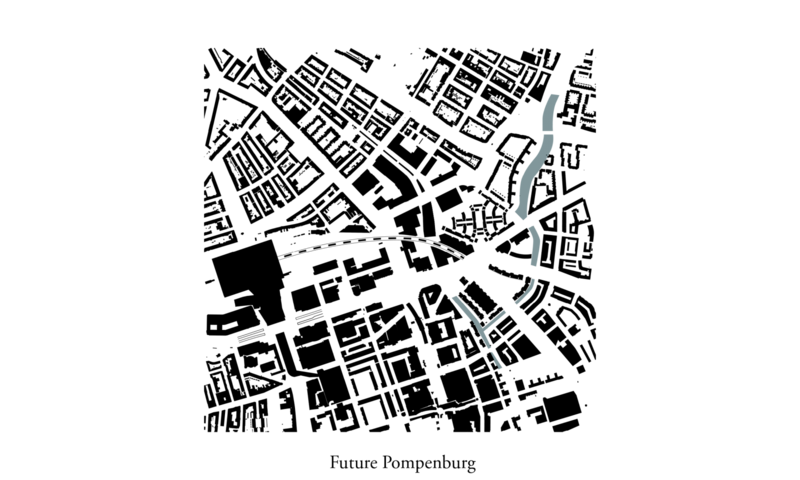 Additionally, new routes will strengthen Pompenburg’s function as a logical link in Rotterdam’s public transport network. Above all, Pompenburg connects people. 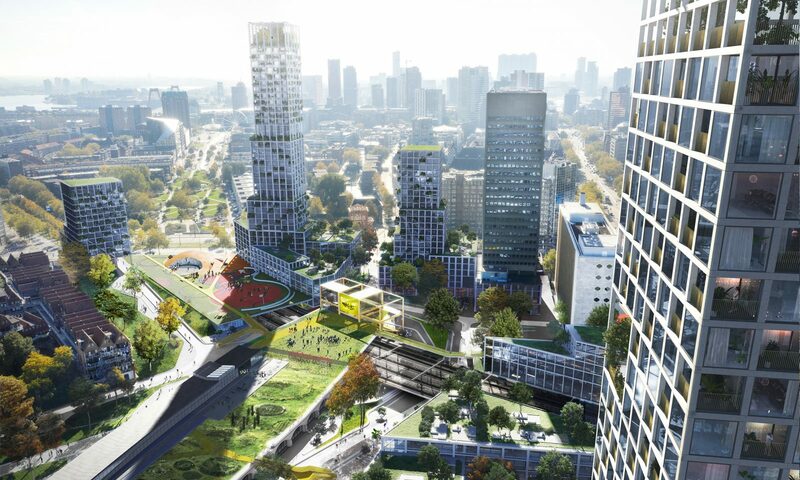 It will be a lively destination that naturally appeals to locals, Rotterdammers and visitors. 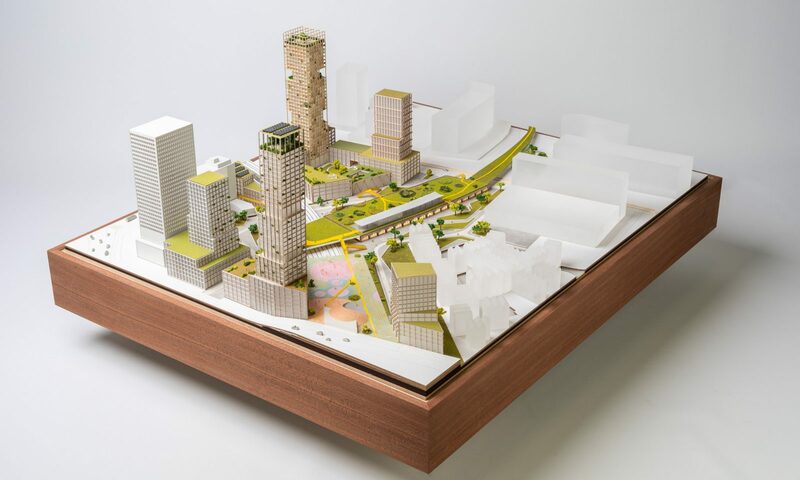 The result is a close collaboration with residents and stakeholders, a high quality of architecture and public space and an engaging programme led by local entrepreneurs. 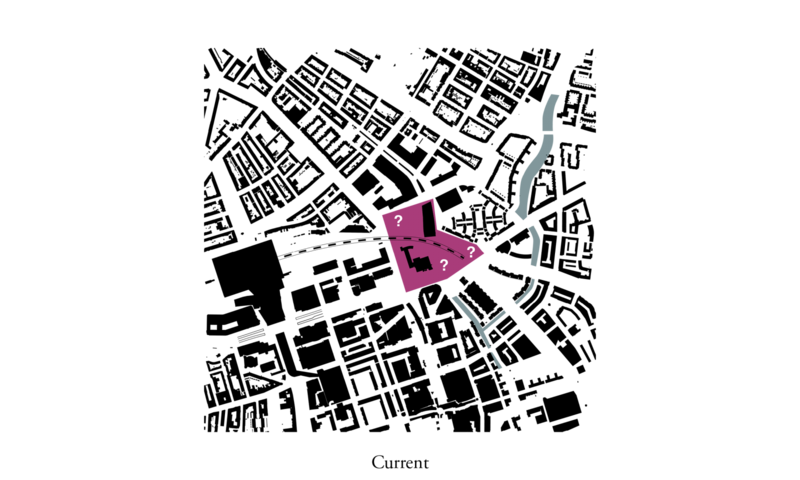 Pompenburg is both a destination and a thoroughfare. This cross-connection is clearest in the design of the public space. 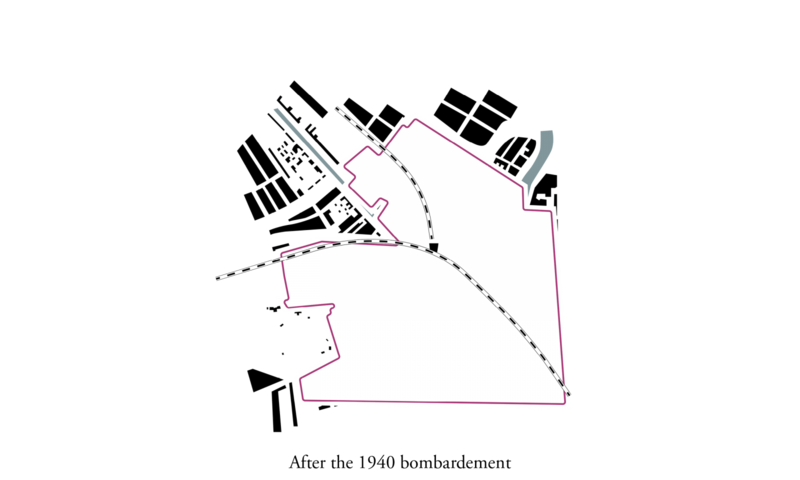 From the heart of the area, it links with the three surrounding neighbourhoods, resulting in three interconnected squares. Each has its own identity: metropolitan, city and neighbourhood. Pedestrian and cycle paths connect to existing networks and cars play a secondary role here. The plan proposes to retain the temporary Luchtsingel as a permanent feature in a new form. The roof of the station building remains a public space as part of the Luchtspoor park, a green urban zone that extends to the Binnenrotte and the Maas river. The old passage through Hofplein Station will be reinstated. 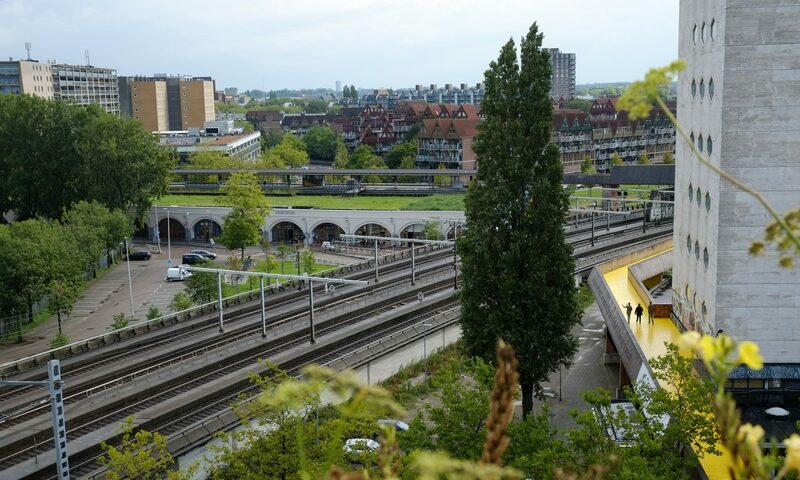 The possibility of widening the tunnel under the railway at Raampoortstraat is being explored, and also closing over the tunnel entrance to create a roof for a sports area and to reduce pollution and noise for the neighbourhood. The redevelopment of Pompenburg forms another chapter in the turbulent history of the site. 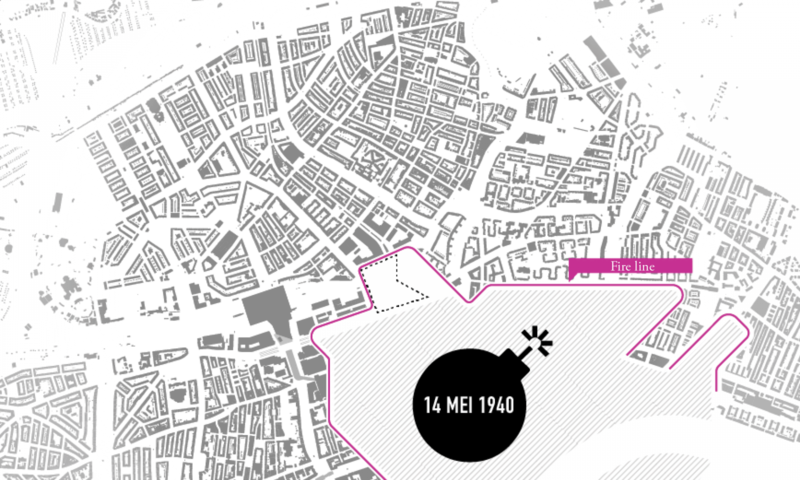 After the devastation caused by the WWII bombing of Rotterdam, the area was never integrated into its urban development and is still known as the city’s last bomb site. 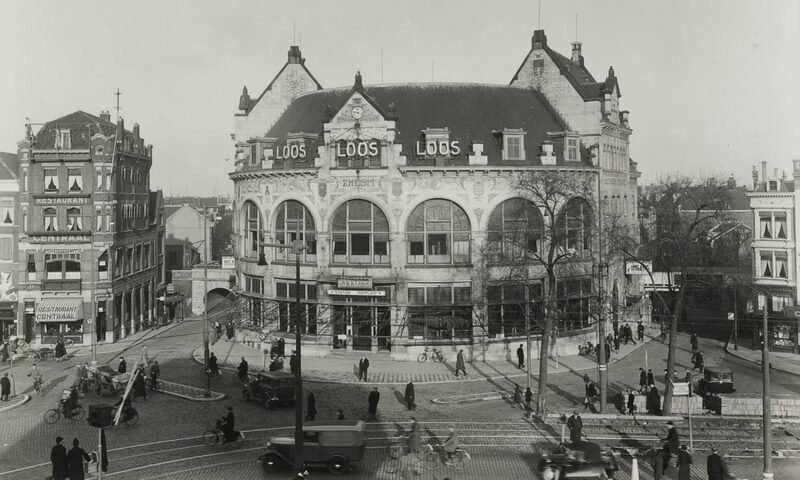 Before the war, Hofplein Station served as a public transport hub, Café Loos was known for its buzzing nightlife and the Schiekade still bordered the water of the canal. In the decades that followed, a new station was built, the area was surrounded by offices for Shell – with a busy petrol station – the Stroveer residential neighbourhood was built on the Heliport site and the new train tunnel from Blaak station emerged from underground there – this still forms a considerable physical barrier.For more than thirty years, development possibilities have been investigated in the Pompenburg area. 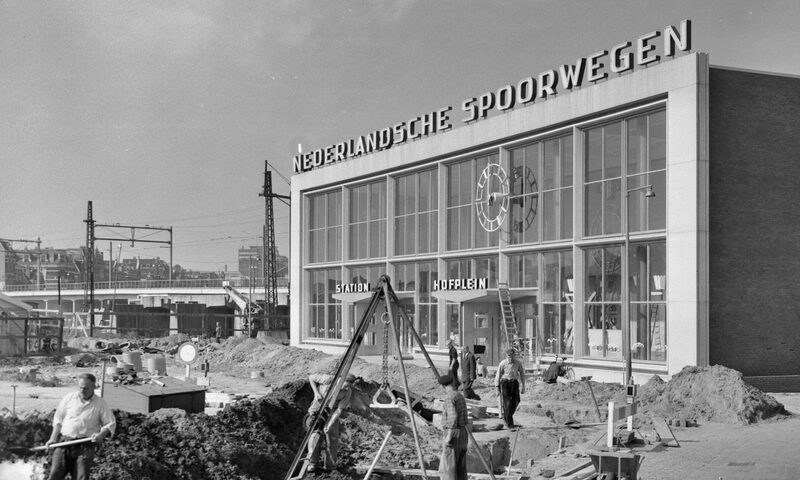 During that time, Hofplein Station became heritage-listed, hosting mixed uses inside and on top of the building, and recently gained attention with the Luchtsingel project. 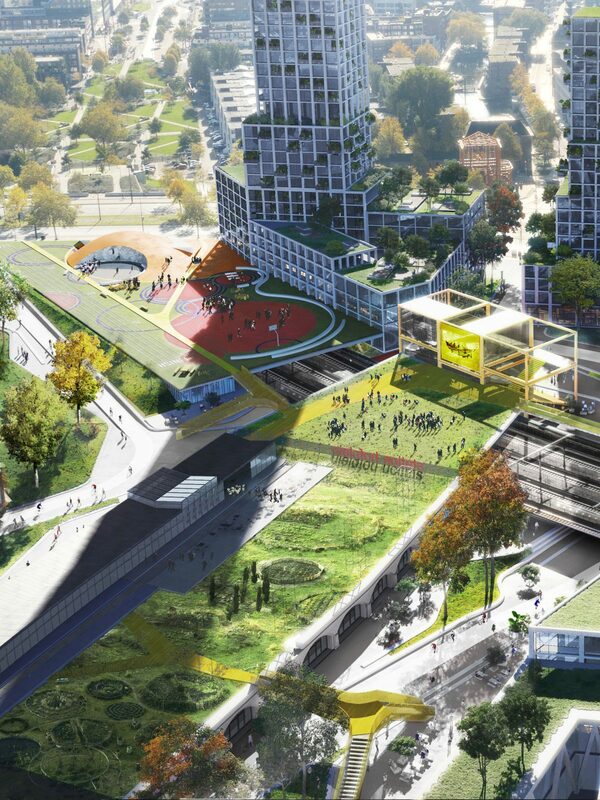 Central Hofplein Station - A trio of green urban squares. Hofplein Station will soon take pride of place in the middle of the square which gives the heritage-listed building space to breathe. 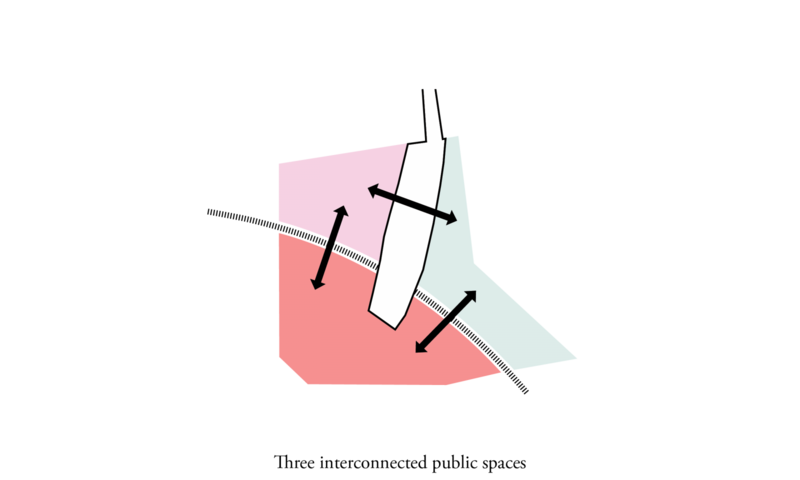 The three sections of the square each have their own character. 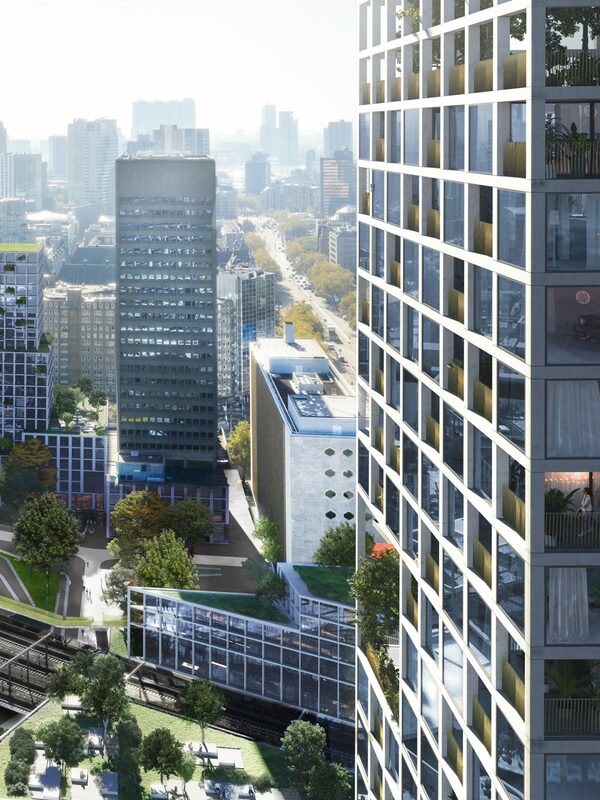 They are designed as green, activating spaces constructed with typically Rotterdam materials and details to integrate seamlessly into the city’s urban fabric. The square, together with the upper ground floor and green roofs, which act as water buffers, will help boost urban biodiversity. 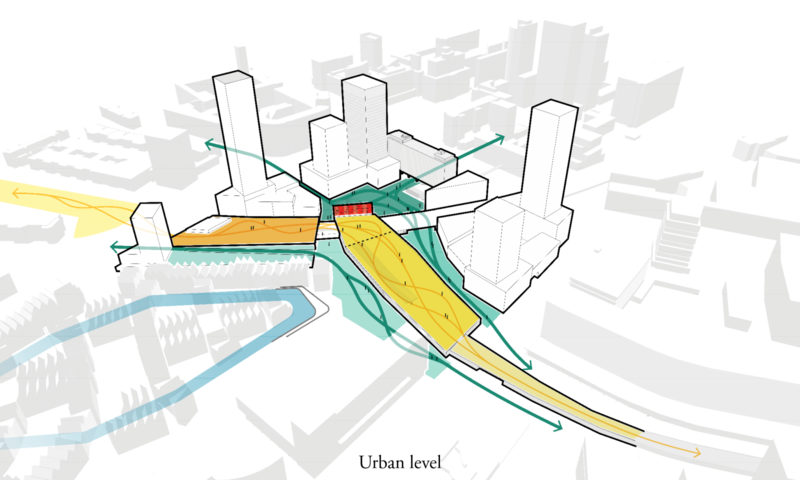 Facing the city centre, Hofplein Station will be extended until the railway, with a bridge crossing it and an extra accent on the square space on the other side of the track. 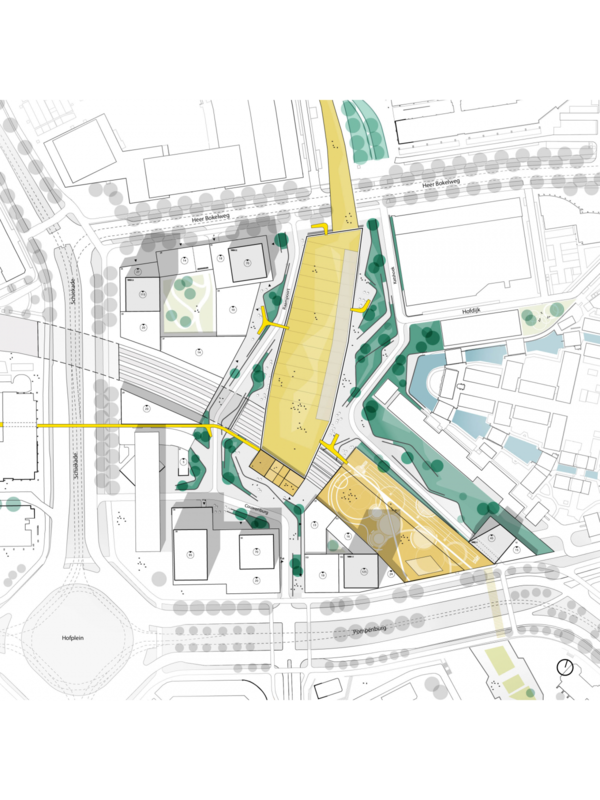 The latter refers to the original station, designed by Sybold van Ravesteyn, increases the site’s visibility and improves connections with Delftsestraat and Haagseveer. Rotterdam from eye level to sky level. 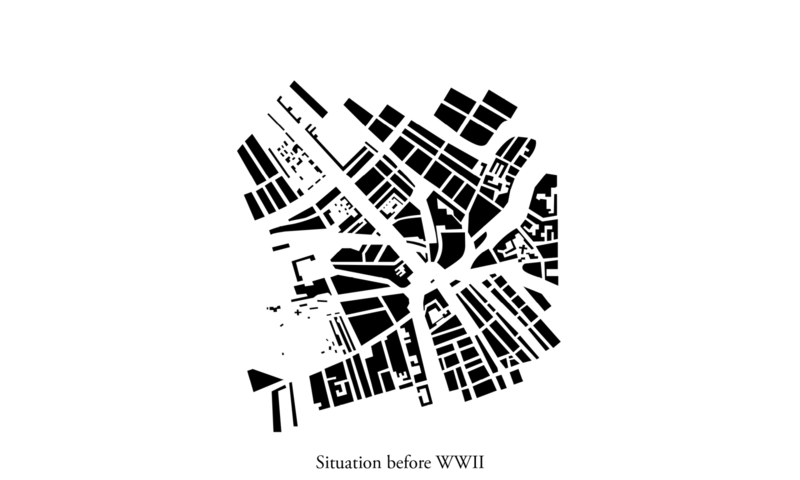 After completion, Pompenburg gains a visibly metropolitan quality. The volumes rise outwards from the central square, the lowest point of the site, to emphasise its intimate quality. Low-rise buildings of five to six storeys surround the square, linking to the typical Rotterdam low rise in the city around Pompenburg. 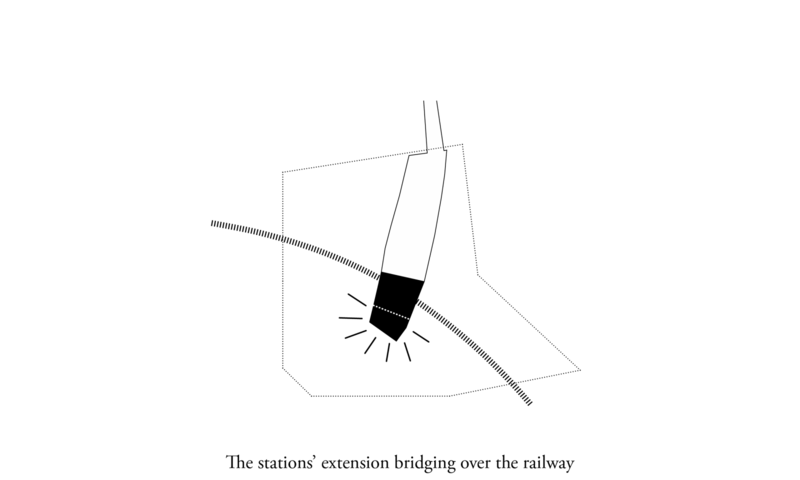 The highest volumes mark the link on sky level. The remaining new buildings create a gradual transition between these two scales. The architecture of the new volumes is both appealing and inviting, yet modest and representative. The new buildings clearly relate to each other with their construction and transparent facades. Within the Rotterdam skyline, they are recognisable from afar as a group. A closer look reveals the details of the individual buildings. The towers are slender and rest atop a solid base. This offers enclosed space within for services and installations, which allows an open outer zone for the lively functions of the podium. 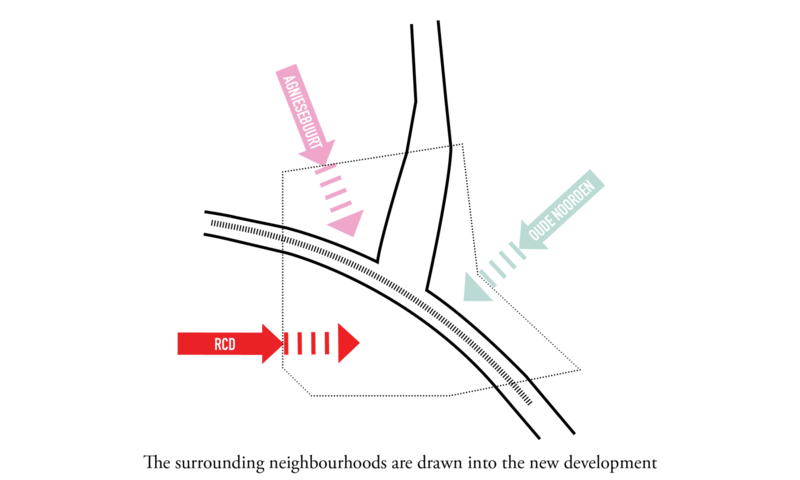 The volumes gradually step upwards as to minimize the blocking of sunlight and avoid wind issues – this also lends the buildings their distinct profile. Additionally, the buildings facing Hofplein Station have setbacks that open up space for shared roof gardens. 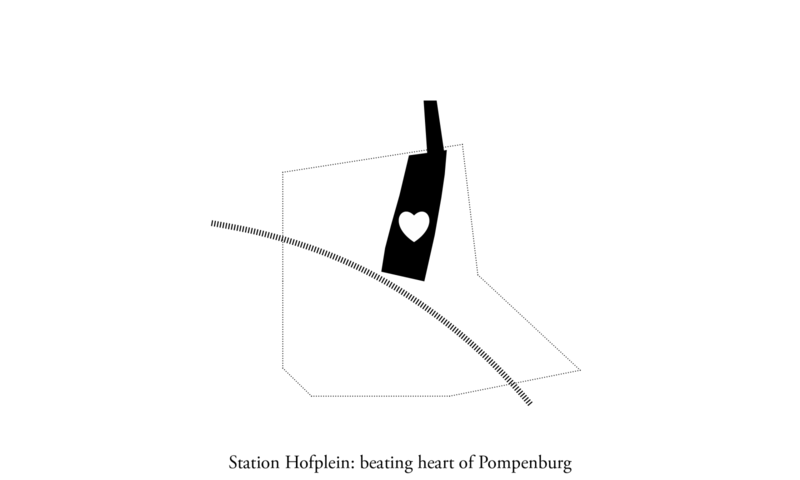 NieuwPompenburg.nl is initiated to keep you posted. A sheltered urban landscape, an oasis of calm in the midst of Utrecht’s hectic public transport hub.